Dwayne Menezes: Welcome to the inaugural session of our ‘SDGs in the Arctic’ high-level dialogue series. 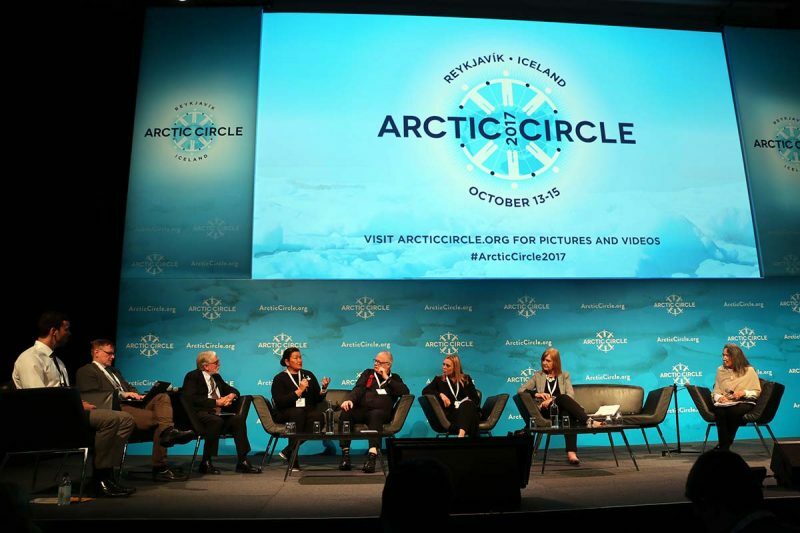 We are delighted to host the first session of the series here at the Arctic Circle Assembly, a conference that has grown over the past few years to become the world’s largest international annual forum on the Arctic. I would like to thank the Icelandic Ministry of Foreign Affairs for joining Polar Research and Policy Initiative (PRPI) as the co-host of this event, as well as our principal academic partners, the Johnson Shoyoma Graduate School of Public Policy at the University of Saskatchewan and Trent University in Canada for their support. The session will be chaired by Dalee Sambo Dorough, the former chair of the UN Permanent Forum on Indigenous Issues and currently an Associate Professor at the University of Alaska Fairbanks. To start, I’d like to invite Sturla Sigurjonsson, Permanent Secretary of State of Iceland, to offer the opening remarks. Sturla Sigurjonsson: Excellencies, Ladies and Gentlemen, thank you for being with us today to discuss the importance of the Sustainable Development Goals in the context of the Arctic. Agenda 2030 and the SDGs are indeed a remarkable achievement. We have set ourselves ambitious goals that are integrated, indivisible, global in nature and universally applicable. In practice, this means that we cannot reach one goal without working towards attaining others. What we do in one part of the world matters in another. We must all work hard. The Arctic embodies what Agenda 2030 and the SDGs are all about. A region rich in natural and cultural diversity, it contributes little to climate change and environmental degradation, but the consequences are nowhere as visible. What is more, it clearly demonstrates how the world is interconnected. What happens in the Arctic does not stay in the Arctic. The melting of the polar ice in the North has wide-ranging effects, including higher sea levels in the South. Furthermore, the good cooperation between interested parties within the framework of the Arctic Council gives hope that states can put aside their differences and work together towards a more sustainable future. Most of the 17 goals are highly relevant in the Arctic region. Climate action is high on the agenda, and Iceland has highlighted the importance of the sustainable management of natural resources, both on land and at sea. We are keen to share our experiences and work together with our partners in the Arctic Council to chart a way forward. The oceans are at the center of all of our work. According to predictions, we will have warmer water affecting all life in the sea, and possibly, the way of life of Arctic communities. Based on science and innovation, we will need to sustainably manage marine resources to preserve biodiversity and ensure food security for Indigenous Arctic communities. Access to renewable energy is yet another goal that can only be attained in the region through concerted efforts and innovation. The Arctic Council has also taken the lead in the field of renewable energy, focusing on projects to lower carbon emissions in the region. For instance, in early November, participants in the Arctic Remote Energy Networks Academy project, sponsored by the Ministry for Foreign Affairs of Iceland and the Geothermal Training Programme of the United Nations University, will gather in Iceland for a two-week course concentrating on, among other things, heating and geothermal energy. Climate change is causing polar ice to melt, which accelerates climate change – a vicious cycle. While the melting of polar ice poses great challenges, we may also see the opening of Arctic sea routes within the next few decades. Throughout history, new sea routes have marked significant progress. In our globalised world, Arctic routes will bring new economic opportunities to the region. While we must enable Arctic Indigenous peoples to preserve their heritage and their way of life, we are also keen to empower them to attain a level of social and economic development through education and improved access to health services. Iceland knows through experience how important it is to preserve our heritage and culture through our language. In the same manner, we want to protect biodiversity. We should aim to preserve our languages, which contain an accumulated wealth of knowledge. Iceland also knows firsthand the massive potential resting in gender equality. In all our international cooperation, we emphasise women’s empowerment. The Arctic is no exception. Iceland has led the Arctic Council’s work in this field. Empowering women is not only a human rights issue, it is an economic necessity. It is Iceland’s firm belief that the sustainable development of the Arctic region requires an extensive and broad cooperation within the Arctic Council and beyond. International collaboration over the next 15 years will have to take account of the implementation of the Paris Agreement, as well as the UN Agenda 2030 and the new Sustainable Development Goals. These apply to all countries in the world. These will be our guiding lights as we prepare for Iceland’s chairmanship of the Arctic Council in the period 2019 to 2021. Agenda 2030 and the SDGs are grounded in the Universal Declaration of Human Rights. We should be mindful that all of this is about people. It is about building a sustainable, prosperous future for people everywhere, including people in the Arctic. The Paris climate agreement and Agenda 2030 provide the blueprints for our success. Now we must deliver. Thank you for your attention. Dalee Sambo Dorough: Thank you to the Permanent Secretary of State for Iceland. As Dwayne noted, my name is Dalee Sambo Dorough. I’ll chair this session. Allow me to quickly introduce the panel presenters. Our format will be as follows: I will set a series of questions to which the participants will respond. First of all, beginning on my far right and your left: Mitchell White, Jane Glasco Northern Fellowship Alumni, Gordon Foundation of Canada; Timo Koivurova, who will be our principal respondent today, is Director and Research Professor, Arctic Centre, University of Lapland in Finland; next to him, Jeremy Rayner, Professor, University of Saskatchewan in Canada; next to him, Aleqa Hammond, Former Premier of Greenland and Chair of Greenland Committee of the Danish Parliament; to her left, Tony Penikett, who is the former Premier of Yukon and a Visiting Professor at Simon Fraser University; to his left, María Mjöll Jónsdóttir, Director of the UN Affairs and Gender Equality, Iceland Ministry of Foreign Affairs; to her left, Heather Nichol, Professor, Trent University. As has been noted, the significance of the SDGs in the Arctic are critical. My question to Timo is: How does the 2030 agenda for sustainable development fit within the priorities of the Finnish chairmanship of the Arctic Council? Timo Koivurova: Thank you, chair. Basically, Finland has paid attention to the existing Sustainable Development Goals as a priority for our chairmanship program. We already, at an early stage, had them in our preparation for the chairmanship that started in May 2017. We consulted with other states and permanent participants as well. It’s interesting that we had sustainable development as the second pillar of the Arctic Council from the very beginning. There hasn’t been any linkage with the Sustainable Development Goals that started in the early 1990s. Now, the time has come that these two agendas can go together. Actions are already taking place because Finland has been a chair for about a year now. For instance, I’m leading a consortium at the Arctic Centre on issues with the Environment Ministry. We are producing knowledge, with our Arctic team, that will drive the Finnish chairmanship. 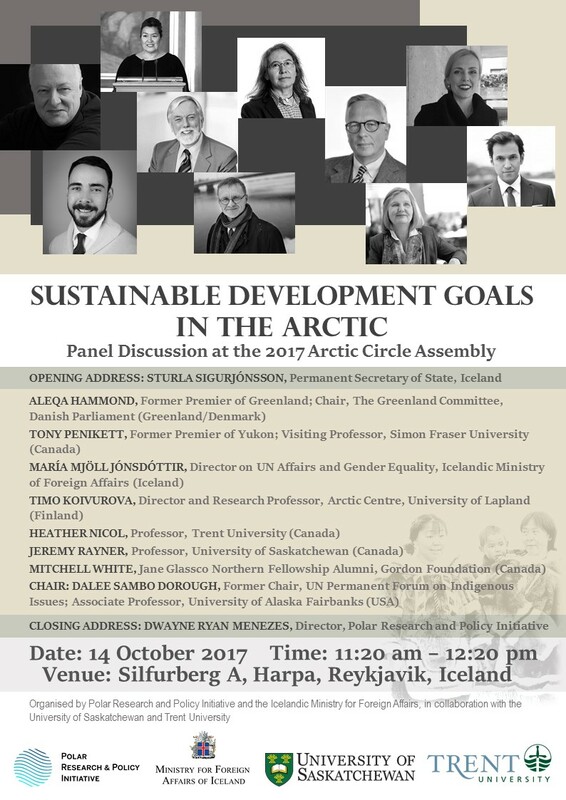 We did a briefing paper on how these Sustainable Development Goals could go into the functioning of the Arctic Council. Perhaps I’ll have time to say something about that. Of course, Finland has to then take these ideas and decide whether these are viable by discussing these with other member states and permanent participants. It’s important to mention, also, that the SDGs have not been integrated fully within the Sustainable Development Working Group at the Arctic Council. . . One of the two research arms of the Sustainable Development Working Group is currently re-thinking our mandate and whether the SDGs are something we serve as a niche within the Sustainable Development Working Group system and the Arctic Council in general. Finally, Finland is also trying to make the first ever long-term strategy for the Arctic Council, of course together with member states, permanent participants and other components of the Arctic Council system. I think it is likely that the SDGs will be part of that plan. Dalee Sambo Dorough: I’m sure everyone in the room concerned with sustainable development has memorised all of the goals (laughing). Goals 1,2,3, 4 and 6 relate specifically to poverty, food, health, education, water and sanitation. I’d like to ask: how do these goals relate to the Arctic, specifically, and especially, to Indigenous peoples? In this regard, may I invite Aleqa, as an Inuk woman, to respond? Aleqa Hammond: Thank you very much. First of all, Greenland is very active within the Sustainable Development Working Group in the Arctic Council. We have delivered projects of substance. Greenland finds the way the world sets up the definitions of sustainable development very important. Our national economy comes from the environment and animals. This is just as strong as it always has been. Our understanding of sustainability is very important for all of us. How does it affect all of us in our economy? How does it affect us in our cultural life? How does it affect families in our society? National goals and the international goals must be understood and comprehended by families making a living off nature. Families must have their own say when setting up goals for sustainable development in society. Families must have a chance to put out their own ideas on sustainability. At present, it is not based on their own inputs in international and national goal setting. Indigenous peoples of the Arctic will not have a sustainable goal for their economic development if it is all based on definitions that they will not comprehend. For this relationship and co-responsibility, understanding the terms is very important to create sustainable development in the future. Dalee Sambo Dorough: Thank you for underscoring the Indigenous perspective on the development of the SDGs. I would like to invite Mitchell to comment on this broad question. Mitchell White: Let me start by saying what an honour it is to be amongst such esteemed speakers. The Sustainable Development Goals of poverty, food, education, water and sanitation, or lack thereof, are things you would generally associate with third world countries. When you look at the Sustainable Development Goals, it seems like most of the work that will be carried out is in third world countries. You wouldn’t expect those issues to exist in Canada. They very much do. The Trudeau Government is seen as a champion of these issues. You would expect us to be one of the contributors that provides aid to other countries to bring them up to be on par with where we are. Third world conditions very much exist in Northern Canada. Third world conditions very much exist at home. I can attest to that. I’m an Inuk from Northern Labrador in Canada. My Mom has had to make decisions about food and other necessities. In my home community, we have a clinic that only has a nurse. We have to travel hundreds of kilometers to get treatment for minor things. For example, I broke a tooth once. We don’t have a dentist. I had to walk around with half a tooth for two months. Education rates among Inuit are far less than the rest of the Canadian general public. Indigenous communities are mostly under boil water advisories. When you look at Canada, you think we’re a first world country. We are one of the most prosperous economies in the world. Yet, many of these issues exist in Northern Canada. There’s a joke among many of my colleagues. When you hear of Canada delivering first aid to third world countries, you say, “Where do we sign up for this aid?” It’s a strange situation where we’re seen as a champion that will come to the aid of people who are suffering from these issues, but people at home – the Indigenous peoples, the original inhabitants of the country – are suffering. How do the Sustainable Development Goals relate to the Arctic? These issues very much exist in the Arctic. Dalee Sambo Dorough: Thank you, Mitchell, for pointing out not only issues in the Canadian Arctic, but conditions that are uniform across the circumpolar Arctic. You pointed out there’s a false dichotomy between the developed world and developing world, which the UN is so accustomed to. We need to break that barrier down in the context of Indigenous peoples. In relation to education, I’d like to invite Heather to make some comments in regards to the SDGs. Heather Nichol: It’s a perfect segue into what I was going to talk about. I’ve been thinking, as an educator that works with UArctic coordinating circumpolar studies in North America (and also as a southerner), it’s an interesting question for me to consider, and think about these broader relationships. If you think about how the SDGs have evolved, from the Millennium Goals to today, they are certainly much more sensitive to the issues we’ve been talking about in terms of: “What does it mean for Northern Communities to be faced with challenges educating populations in ways that are also attuned to Sustainable Development Goals?” I think that what is rather interesting is, if you look through the education goal itself, the sorts of things that are important in terms of inclusivity and gender equity apply to northern populations. But, there are also things there that do not apply that makes us think that some of the Sustainable Development Goals for education might be worked through . . . and try to make them more sensitive to Northern contexts. For example, one of the solutions to problems in education in the goals is scholarships for students. That’s wonderful, but in the North, having somewhere to take up a scholarship is also important. That might involve leaving the community. If you don’t leave the community, how do you support the network of schools and facilities that must be as well resourced as they might be in larger centres? Of course, there’s the question of language. All of these things are very important in terms of implementing inclusive, sustainable education. I would suggest that one thing we should really think about is that it’s critical for work to de done in the North and for knowledge to be mobilised so that it feeds into the way in which education is implemented in the South. We could go into some of the legacies of the North that we don’t need to now. Dalee Sambo Dorough: I’d like to turn now to Tony Penikett, who is acutely aware of socioeconomic conditions in the Yukon and elsewhere in the Canadian North. Tony Penikett: Let me pick up on what other people have said and talk about sustainable development from this basic fact: The Canadian Arctic is different from other Arctic states in that we are on the only country in which approximately half of the population is Indigenous. That has created the possibility for a kind of dialogue that has been transformative in policy terms. To use the major example, Gro Harlem Brundtland’s support for sustainable development had a very big impact and has been very influential in the northern parts of Canada. One of the important legal instruments was the creation of modern treaties for Indigenous communities in the years since 1986. I’ll give you one example how that played out. In the Yukon Territory when I was in government, we were faced at the treaty table with a very interesting problem. We had one law that governed the hunting for non-Indigenous settlers and another law that governed the hunting for Indigenous people. Basically, it covered the right to hunt for food on Crown-occupied land. The problem with having those two laws was that everyone at the negotiating table recognised it was bad conservation to have two competing regimes. In the treaty negotiations, we resolved to have a single system. The people that previously had the most influence on game hunting was commercial hunters. The people who had the second-most influence was sport hunters, basically non-Indigenous peoples. The third group were Indigenous people. Conservation interest had almost no interest at all. That whole system was flipped around in the land claims agreement. Conservation became the first principle. Indigenous people and non-Indigenous people agreed that no one would be allowed to hunt any species with populations below conservation levels. The next claim on the resource would come from subsistence hunters, people who hunted for food (mainly Indigenous people, but not entirely Indigenous people). Sports hunters, and also northerners who hunted for fish, halibut or moose, did it not just recreationally, but also for their family’s health. They needed to get food in the freezer for the winter. In communities where there was a lot of seasonal work and seasonal wages, that was very important. The last claim to the resource under the new regime was commercial hunters. As a consequence of that, most big game enterprises have gone out of business as people have reclaimed their authority of the resource. The implications for food security are obvious. The implications for control of management has been co-management boards, with equal representation for Indigenous people and non-Indigenous people. This idea for co-management has emerged in all of the northern communities since 1986. It is even now present in Norway and other jurisdictions. What’s important is that this is the only place in Canadian law where sustainability is embedded in constitutional law. Dalee Sambo Dorough: Alaska is still trying to flip the hierarchy in terms of harvesting rights. Moving on, as far as goals 7, 13, 14 and 15, which relate to energy, environment, resource and climate policy, how do these goals represent opportunities and challenges in the Arctic region? I would like to invite Maria to comment, followed by Professor Rayner. María Mjöll Jónsdóttir: I think all of those are interrelated, just like the entire agenda. In terms of sustainable management of our natural resources, it relates to food security and the issues we have talked about. I think the highest challenge on our agenda is climate change. When we think about the Arctic and the changes taking place, it all goes back to climate change. It impacts our land, fisheries and everything in the other goals. The main challenge is climate change and the uncertainties we face. How will this end up? What are the scenarios we face? In that sense, Arctic Council and its partners are doing enormous work in terms of scientific work and gathering information, including from Indigenous communities. Traditional knowledge is incorporated. In Iceland, we have CAFF and PAME. We are looking at greener land, permafrost disappearing, sea levels rising and melting icecap. We see fish moving into warmer waters. It should be good, but these are actually enormous challenges. Habitat laws for species and the traditional people who depend on it face challenges. We have tourists coming. We need to manage all of this carefully. We have to base our policies on science. We are focusing well on that. I am optimistic. Dalee Sambo Dorough: Thank you for echoing the interrelated nature of these issues. Professor Rayner, do you have a response? Jeremy Rayner: The Sustainable Development goals, as everyone here knows, were developed to address the shortcomings of the Millennium Development Goals; especially that those MDGs were not integrated with each other. Countries used that opportunity to cherry-pick their response to how well they were doing in respect to different goals. We hope the SDGs will be different. The challenge is policy integration and coordination. A lot of countries face this challenge. Canada is no better or worse than many others are. For example, energy is a fundamental theme across all of the SDGs. It does not makes sense to talk about achieving food security, clean water, provision of livelihoods, climate change mitigation or sustainable economic development without talking about energy, and vice-versa. The comprehensiveness of the SDGs is going to be one of the most significant challenges, but also one of the most significant opportunities. The other thing I’d like to say is that the SDGs themselves often bear quite serious implications. Number 7, on energy, calls on people to have affordable, reliable, sustainable and modern access to energy. Anyone who has had an experience at the UN system will have some idea of the diplomatic work that went into the choice of those particular words and no others. It reminds us of the challenges of thinking of the Arctic and other parts of the world. Generating your energy through diesel power is a modern form of energy. It’s affordable and economical. In many parts of the world, it would be considered a very significant upgrade. Yet, we recognise that, in many ways, it’s the problem, not the solution. We need to think carefully, as a research institution like Arctic Circle or a university, about what energy outcomes are crucial to the realisation of the SDGs in the Arctic. Dalee Sambo Dorough: I would expect that Aleqa will have an interest in responding to the question of energy and environment, which relate to another series of goals, namely economic growth, industry, innovation, infrastructure, inequalities as well as sustainable cities and communities. Aleqa Hammond: I think that it is very interesting. When we are talking about energy and having an energy sector based on sustainable development, I can inform everyone today that Greenlanders are users of electricity generated from hydropower. Greenland is 75% self-sustaining. We are really taking advantage of the possibilities Greenland has in order to create clean energy. In terms of sustainable development, we do really well. Still, food security matters. Climate change is creating very big challenges for our national economy based on our usage of land, especially for smaller regions of Greenland. Smaller settlements are largely dependent on what they bring in from land and sea. The economy is based on the sustainable development goals set by the government. I think that, if a country is to have sustainable development goals as a nation, to live up to its obligations, it is very important that the scientific data is updated at all times to reflect security and economic opportunities for the locals. It must be there at all times. The scientific data often is not up-to-date. We have to be cautious when setting the quotas for fishing and hunting. If we don’t have the data, we might have to be more cautious. The people that suffer are the Indigenous peoples who make their living on the land. If we are not to be the losers of the transition to sustainable development, it requires very strong scientific data. Dalee Sambo Dorough: This might be a good segue into goal 16 and 17, which relate to institutions of governance and access to justice, as well as the importance these to achieve the sustainable development goals. I would invite Heather to respond to this particular issue, as well as former Premier Penikett. Heather Nichol: I am thinking about social infrastructure and the way in which we think of how to deliver that. How do you actually develop the kinds of infrastructure necessary? There are incredible limitations in terms of what innovation one can do. How do you support all kinds of activities, such as education and other services? That idea brought me back to partnerships and institutional relationships to deliver social infrastructure. In the North, I think it is a sensitive topic. The role of government in the Canadian context is highly necessary. Yet, we have a problem in terms of using its decision-making capacity and being the decision-maker. I do not have a solution. I do not think we have laid out the way the end should look in the Sustainable Development Goals. In the Arctic, there is incredible variability. How do we shape these institutional arrangements in terms of delivery of social infrastructure and other issues? Tony Penikett: When I was young and serving in the Canadian North (and I think this is like the North in other countries), the national sub-centers talked down to Indigenous people and the settler population. The major transition in Arctic governance and sustainable development has been the advent of new forms of government that are not understood in the South, in many cases, they are the result of hard fought dialogue between Indigenous and non-Indigenous communities. Out of that process, to use an Alaskan example, at the point it was discovered that the land claim agreement was enacted by Congress, as opposed to negotiation, you had the sudden arrival of large numbers of very bright and able Indigenous representatives in the State House and State Senate. Regardless of whether they were Republican or Democrat, they often talked as a group to achieve the balance of power in the legislature and be the trump card in many debates. That played out differently in Canada. I led the first government in Yukon that had, in my caucus, the majority Indigenous members. We had 5 Indigenous members and 4 non-Indigenous members. It was a fragile coalition, but we were able to move the land claim towards a settlement. There were other issues, such as language rights, that were great acts of reconciliation, which created a more sustainable community. Northern legislatures follow a Westminster system for electing legislatures, but do not have a party system. With respect to Indigenous tradition, they follow a consensus-based system, as they do in Nunavut. I find Nunavut particularly interesting because it is the only place I have seen where non-Indigenous members of the legislature address the assembly in Inuktitut. It is a sign of reconciliation and making governance more sustainable. Many of the institutions created by land claims treaties are new kinds of institutions that are not well understood outside the territory. Those outside of our countries will think of newer agreements, such as Greenland Home Rule, as extraordinary. They think of them as somewhat like what happened in the nineteenth-century Indian treaties. To give an example of scale, Alaska’s settlement covered 178,000 square kilometers and a billion dollars. Canadian Indigenous people rejected that in favour of tribal governance. The scale is different. 7,000 Indigenous peoples in Yukon own 41,000 square kilometers of land and have the mineral rights on two-thirds of that territory. That amount of land is more than is contained in all the Indian reservations for 500,000 people in Southern Canada. The treaties negotiated in recent years are not like the nineteenth-century treaties that created reserves and pockets of permanent poverty. Those created complete control of Indigenous peoples by the Federal government. We have something new and largely invented in the North. The Northern way is more likely to create sustainable governance than institutions of the past. Dalee Sambo Dorough: Thank you. It is useful to think of the responsibility of Indigenous governments to fulfill the SDGs. I’d like to invite Mitchell White to speak. Mitchell White: To respond to Heather, the government has a responsibility to create infrastructure in the North. The government of Canada prides itself on overcoming the wild and creating the railroad from east to west. They take pride in all the benefits that come from railroads and roadways from east to west, as well as broadband that extends east to west. Indigenous people don’t have highways (which is something up for debate). In terms of broadband, all of the benefits that come with that aren’t available to Indigenous people. Indigenous people in Canada’s North have been forgotten. The government of Canada has a responsibility to create infrastructure, especially broadband. Dalee Sambo Dorough: It’s another example of the disparities that exist north to south. I’d like to set this last question to everybody. How can we take the SDGs and make them actionable and actually implement them on the ground, as well as monitor them? Timo Koivurova: The work has just begun. We have already referred to the research consortium we are leading. It is up to the Arctic Council chair to decide what way to go, in terms of the existing system and how the SDGs can be inserted into that system. A lot has already been done in the Arctic Council, in working groups and the SDWG. An example is the Arctic Social Indicators. There is a lot to analyse. What have we done? Some SDGs are already realised. We need more knowledge. We have a framework and goals. We have indicators. We need to adjust to indicators towards sustainable development in the Arctic. To take one example of subsistence livelihoods, it has to relate to thinking on sustainable development in the Arctic. Our thinking is that all ecological change in the Arctic is occurring due to outside forces. We think the Arctic is opening. We need to understand the Arctic situation in the global context. Jeremy Rayner: It seems that the challenge here is to balance the top-down forces and the bottom-up forces. You cannot have an exclusive emphasis on one or the other. Unless the Sustainable Development Goals link to the lived reality of communities, this will be yet another alien imposition onto communities of the world that have seen so many impositions already. It is challenge of social innovation. Aleqa Hammond: Between Arctic countries in the Arctic Council, we have a mutual understanding of sustainable development in the region. There are projects and working groups. I think it’s a perfect way of working together on issues of great importance. My concern is the way sustainable development is understood outside the Arctic region. How is it being received? Very often, the outside world does not understand sustainable development when we are talking about fisheries, sealing, whaling or rights to use our animals. Very often, this creates a clash between interest groups and Indigenous people. Often, we don’t have strong voices compared to animal rights lobbyists. It affects the livelihoods of many people in the Arctic. I think the dialogue between the Arctic region and the rest of the world has to occur with a mutual understanding that sustainable living in the Arctic has a basis in sustainability and responsible policy. We do not want to harm our animals or environment. We are living in harmony with the environment, as we have done for thousands of years. We in the Arctic have a responsibility to reach out to the rest of the world and talk about SDGs. Tony Penikett: My message is that we have to stop kidding ourselves on some things. We have to stop falling in love with the rhetoric of sustainable development. A couple of years ago, in this forum, a former Yukoner Tony Hodge of the International Council of Mining gave an address. He has subsequently written about sustainable mining and mineral extraction. As a former sub-Arctic asbestos miner, I can tell you that I am deeply suspicious of the idea of sustainable mining. I don’t know what it is. Yet, I hear many industry representatives use this language to rep their projects and put it in a pretty package. I welcome an honest debate about these things. We have to get beyond the rhetoric and talk about what is real. María Mjöll Jónsdóttir: I think Agenda 2030 is just a blueprint of how we all must act. In Iceland, we have gone through each point to see where we stand. Everyone must do this, at the regional and local level. It’s kind of a checklist. We check boxes where we have achieved something good and we address our shortcomings. One goal we have not discussed is gender equality, goal 5. In implementing the agenda, that is key. The Arctic is gendered. Fisheries, for example, are male-dominated. We have women going for education and not returning. For sustainability of Arctic communities, we need to look into gender and how we can empower women and young men. This goal can be a key driver to achieve other goals. Heather Nicol: It is interesting that only a few years ago when I was writing articles on sustainability in the Arctic, it was difficult to find people to talk about these issues. What I find fascinating about our discussion today, and yesterday, is how far we’ve come in this forum thinking about sustainability. A few years ago, it was about development. Here we are in this forum talking about what is important and the goals we have. How do we structure these relationships and balance the decision-making. Who gets to control these decisions? Gender equity is really important discussion. 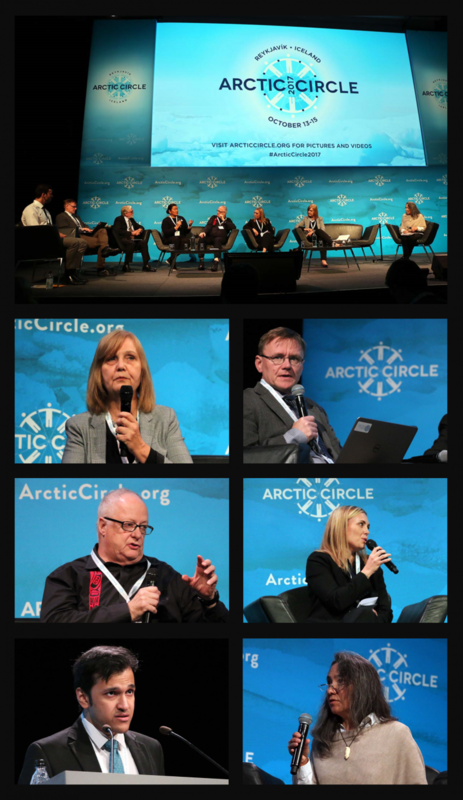 The Arctic Council and its working groups are really important. Mitchell White: It’s a matter of having measureable, defined goals and holding people accountable to those goals. It is not enough to say we are going to end poverty. We need real, tangible results. We need to hold governments accountable. Dalee Sambo Dorough: As far as my perspective, if member states across the globe and in the Arctic were responsive to rights granted in the United Nations Declaration on the Rights of the Indigenous Peoples, we will achieve the Sustainable Development Goals. The UN declaration is at the heart of sustainable development in the Arctic. The UN Permanent Forum on Indigenous Issues has said the goals are interrelated, indivisible and interdependent. It has linkd the goals to the Paris Agreement, climate change and Commission on Financing for Development. We pushed a declaration that these need to be seen as interrelated for Indigenous peoples. There are dramatic disparities in Indigenous peoples regardless of whether they are in the developed world or developing world. The other important matter is the recognition of the obligations that exist in regards to the United Nations Declaration on the Rights of the Indigenous Peoples. There is an obligation reiterated in the adoption of the Sustainable Development Goals and other contexts. States have to take this issue seriously. When the Sustainable Development Goals were adopted, states in the General Assembly recognised the importance of the UN declaration in the context of local, regional, national and sub-national implementation of sustainable development strategies. Eradicating poverty in all its forms is an indispensable requirement for sustainable development. The responsibilities of all states to respect and promote human rights without distinction of any kind are a serious obligation. The challenge is not only for us as Indigenous people in the Arctic to make them a reality, but a burden upon states to be responsive to the aspirations of Indigenous peoples and all peoples in the Arctic.